Below I’ve collected some thoughts on the first half of the WPC 2015 in Sofia, mostly about the puzzles and how they went for me. The second half is still to come (here), but this is getting and taking so long I think I’d better post now. I’ve collected some information from the full result table at http://www.wscwpc2015.org/wpc2015_results.xlsx, particularly the 10th best score of each round, which seems like a good point of comparison. Especially for my personal analysis, since I was hoping to take a shot at the top 10 this year. Since this doesn’t come with any summary yet to put the inevitable criticism into perspective, I’d like to start by thanking everyone involved, but particularly the puzzle authors. While there were some issues with puzzle formatting and point allocation, and general organizational problems, the puzzles themselves were of consistently high quality; I’m not aware of a single broken puzzle. Edit: Here’s a link to the instruction booklet. This entry was posted in Puzzles and tagged wpc on 2015-10-31 by rob. I’m meaning to write up a report on the recently finished 24th WPC. No official results yet, but Ken Endo won the individual competition before Ulrich Voigt and Palmer Mebane, and we (Florian, Philipp, Ulrich and I) took gold with the team in front of Japan, Germany B (inofficial) and USA. Instead, here’s a puzzle I made in preparation for round 9, which consisted of various puzzles built around the idea of marking several areas that had to be filled differently. Rules Solve as a standard Tapa. 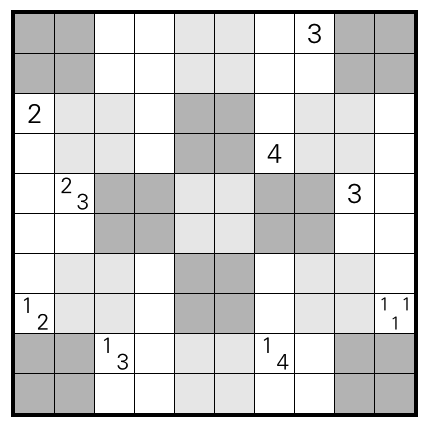 Additionally, each gray 2-by-2 square must be shaded differently. 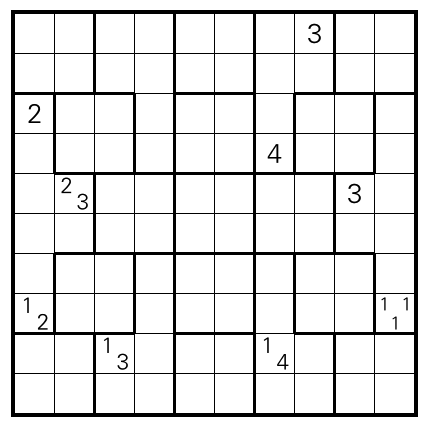 E.g., no two gray squares can have only the top left corner shaded. There are 15 gray squares, the different shades of gray are only there to make it possible to tell the squares apart. Edit Here’s an alternate rendering, due to edderiofer. This entry was posted in Puzzles and tagged medium, tapa, variant on 2015-10-19 by rob.